BRETTON WOODS, NH, March 20, 2009 – As part of a proposed master planned community, Mount Washington Resort has initiated the development of approximately 1,000 new homes and home sites, with the first offerings now available. The real estate and community development, in addition to the Resort’s refurbishment and expansion, is projected to be $1.1 billon and will span the next decade. The property’s four proposed residential neighborhoods will offer something for everyone; whether homeowners prefer a location at the base of Bretton Woods ski area, views of the Presidential Mountain Range rising out of the White Mountain National Forest, or golf course proximity. The communities will be caringly situated on 300 of the Resort’s 1,900 acres of quiet woods and wide-open vistas, with the first offerings available in the planned Dartmouth Brook neighborhood. 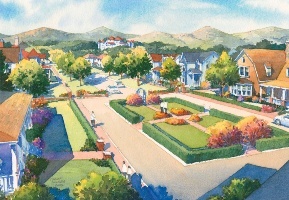 In addition to the three neighborhoods: Dartmouth Brook, Stone Hill Heights and Mount Pleasant, The Common will include a mixed-use pedestrian village at the base of Bretton Woods ski area complete with a variety of shopping, dining, lodging, residential offerings, recreational options, educational opportunities and culturally exciting venues. The Dartmouth Brook neighborhood will be nestled in the trees and offer views of the Presidential Mountain Range and The Mount Washington Hotel. 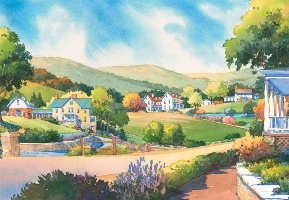 The proposed Dartmouth Brook addresses will include a Hamlet, a quaint setting of single-family homes, townhomes and condominiums; Dartmouth Manors, a series of larger buildings which open up to the scenic ecosystem that comprises a substantial portion of this neighborhood’s open space; the Preserve Estates, single-family homes tucked into the hillside; and Meadow Estates, single-family homes strategically placed on gently rolling grasslands. A trail system will interconnect the different addresses and provide ample opportunity to spend time outside and engage with the natural landscape and wildlife. Dartmouth Brook single-family homesites are expected to begin at approximately $200,000; condominiums are expected to start in the $350,000 - $400,000 range; Townhomes starting in the range of $650,000 - $700,000; and semi-custom homes starting in the $750,000 - $800,000 range. Perched high above Fabyan’s Station, the Stone Hill Heights neighborhood will be sited to capture the scenic beauty and excitement of the mixed-use pedestrian village, The Common. Stone Hill Heights is planned to be a hillside community with two addresses: the Terraces, a mix of townhomes and multi-family buildings; and Stone Hill Slopes, single-family homes. All homes will provide a perfect setting for enjoying the great outdoors and views of the ski slopes. with informal lawns and landscape, creating a smooth transition between the thick National Forest surrounding the neighborhood and the well-manicured golf course. The Common is set to be a mixed-use hub of activity where a variety of residences will be combined with retail, office, educational, cultural and Resort amenities in a walk-able, inviting atmosphere. A weather lab celebrating the weather and climatological phenomena of Mount Washington, satellite university campus for higher education focusing on the sciences of nature, art gallery specializing in art of the White Mountains, general store, transportation center and ranger station are all potential program elements to be among The Common offerings. An array of landscapes including sidewalks, outdoor seating, museums and pocket parks will create a sense of place along the streets in The Common. The Resort’s real estate plans include a concept known as “celebratory development,” incorporating New England historic architectural precedents, smart planning practices and balancing development progress with the preservation of natural resources. Mount Washington Resort’s holistic approach to planning, management and operations aims to balance people, culture, geography and spirit. For more information about Mount Washington Resort’s real estate offerings, please call Mount Washington Resort Realty at 877.548.3697 toll-free, 603.278.1140 local or visit www.livemountwashingtonresort.com. Set at the base of the stunning 6,288-foot Mount Washington and surrounded by nearly 800,000 acres of the White Mountain National Forest, Mount Washington Resort is a four-season vacation destination for guests of all ages. 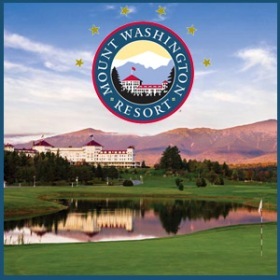 The Resort, world-renowned for hosting the Bretton Woods International Monetary Conference in 1944, offers a vast array of seasonal activities including championship golf on the Mount Washington Course, a newly restored Donald Ross-design, tennis, horseback riding, hiking and fly fishing during the summer months. Alpine and Nordic skiing, snowboarding, sleigh rides, dog-sledding, ice skating, snowshoeing and ice climbing are offered during the winter. 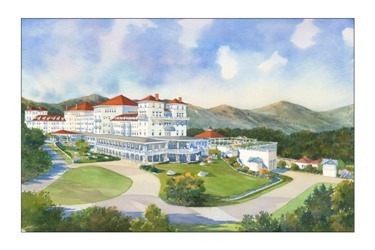 As part of a $50 million refurbishment, the Resort recently debuted a new year-round, world-class, eco-conscious Canopy Tour at Bretton Woods, as well as the Presidential Wing, the first construction at The Hotel in over 100 years. The new Wing houses a 25,000-square-foot Spa, 20,000-square- foot Conference Center and outdoor pool complex. As part of a proposed master planned community, spanning the next decade, plans for the development of approximately 1,000 new homes and home sites have begun with the first offerings now available.